Much of our anxiety comes from the gap between what we expect and what we get. Reality either fails to meet expectations or it wildly exceeds them. Both conditions provoke anxiety and stress. So many of us would be staggeringly grateful for a million euros to fall in our laps, but even if we were assured, even if it were verified and totally legitimate, many of us would agonize about the gift. “Is it real? Is this happening? Why did this happen? It’s good, I didn’t work for it, and thus it cannot be real”. That’s not entirely a bad way to think. If it looks too good to be true, it likely is. However, failed expectations cause a great deal of disappointment. We had hopes…and the hopes were dashed. It’s a horrible feeling. We have expectations of ourselves. Of others. Of our dearest loved ones. The reality gets proven to be somehow less than, not as good as our expectations. We’re let down, sad and disappointed. In time we come around to the reality and adjust. Sometimes. Sometimes we carry disappointment with us for our whole lives. What do we do when we’re let down and hurting? Although I know it’s difficult, I suggest in that condition we allow our feelings to be. For a while, let those emotions alone. I’ve heard people say, “I don’t want to think about it; all I can do now is hurt,” and that is a completely valid, honest thing to say, to feel! When you are ready to let go of that hurt, start stepping back. Review the issue. What’s the objective truth of the matter? Where your expectations realistic? Was the failure of the outcome truly out of the blue? I don’t know if human beings are programmed to create paradoxes or not, but we do indeed create them all the time, and in so doing, we make ourselves unhappy. We disturb ourselves. 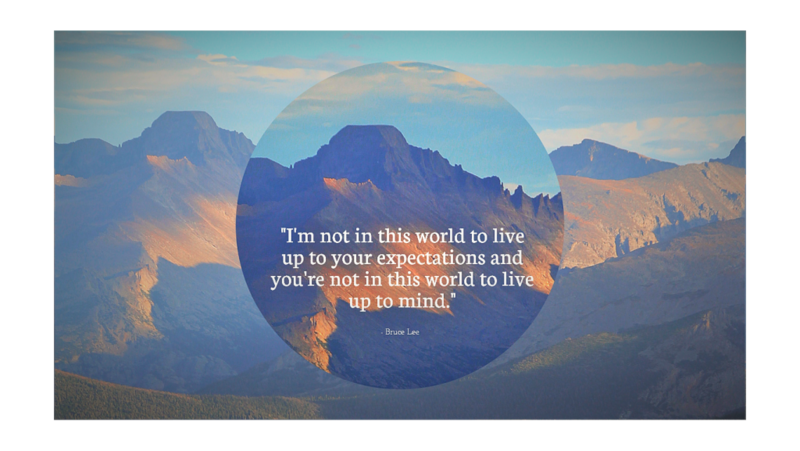 Failing to meet an expectation is not the death of a dream. If we can get a bit of psychological distance from what we expected and what we got, we can accurately appraise and adjust our ideas about what we should get, and what we might get. There is always a “should” hidden inside an expectation. “Should” was made to cause us pain. Don’t put a “shoulda” in your expectations.